The island is full of wonderful adventures, but let’s start with what’s available for you to do right in the bay. Want to go diving? 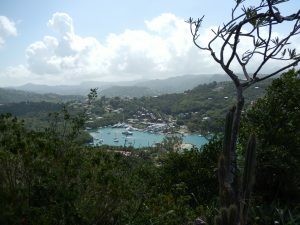 There’s a dive shop right in Marigot Bay at the bottom of our hillside. Dive boats go out daily and sometimes at night. Check out their web site – – www.divefairhelen.com and see all they offer. They also offer snorkeling tours with possible added land tours – – of the Pitons, for instance. Often lunch is included in the tour as well as all equipment needed. Snorkeling. There is good snorkeling right in the bay – -a quick walk from any of the houses. At the bottom of the hill, go to the right and out on the dock as far as you can. Enter the sea here and snorkel along the gabion baskets and out along the north shoreline. Walk to the south side, take a right beside the car park, and follow the road till you come to a right; take this and then go along a bit and take the second right down a road that will take you to Trou Volle. 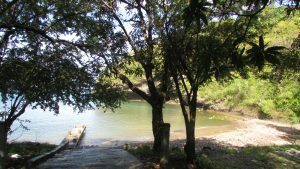 – Trou Volle is a small secluded beach that is a great spot for a day’s walk ending in a wonderful swim and snorkel. Bring along a picnic lunch with some cold Piton beers! 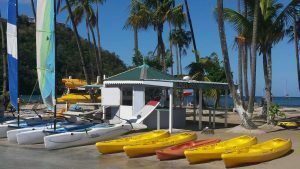 Or for another fun snorkel, take a local water taxi (you’ll find suggestions of people to call at the house) to Anse Cochon — -great snorkeling, swimming and a great beach bar for lunch. How about a day sail? On your own, just go down to water sports kiosk on the beach and rent a small sailboat. I would not advise going outside the bay with it – -winds can be very strong- -but what great fun just sailing around the bay looking at all the grand sailboats at anchor! At water sports, you can also rent a kayak or paddle boards. Or go off with either Bateau Mygo or Oasis boats for a sail down the coast in a larger boat captained professionally. Sail either north or south — your choice — for a full or half day.